In frequency hopping spread spectrum (FHSS) systems, two major problems are timing synchronization and frequency estimation. A blind estimation scheme is presented for estimating frequency and transition time without using reference signals. The scheme is robust in the sense that it can avoid the unbalanced sampling block problem that occurs in existing maximum likelihood-based schemes, which causes large errors in one of the estimates of frequency. The proposed scheme has a lower computational cost than the maximum likelihood-based greedy search method. The estimated parameters are also used for the subsequent time and frequency tracking. The simulation results demonstrate the efficacy of the proposed approach. Frequency hopping spread spectrum (FHSS) techniques are widely used in military communications for combating narrowband interference and for security purposes. The two parameters that are required for the estimation in FHSS are transition time and hopping frequency. Regular synchronization is divided into two stages—coarse acquisition and fine tracking . Reference signals may be used to estimate the parameters [2–6], but they may not be available in all cases. Moreover, since the usage of reference signals requires bandwidth, it reduces the bandwidth efficiency. To improve spectral utilization, several researchers [7–13] have proposed some algorithms for blind estimation. Liang et al. proposed a revisable jump Markov chain Monte Carlo-(RJMCMC-) based algorithm for estimating frequency and timing parameters. However, it requires that the hyperparameter is known in advance. Liu et al. used an antenna array and the expectation-maximization (EM) algorithm to estimate multiple FH signals, but the computational complexity was high. Mallat and Zhang  used the matching pursuit (MP) method that decomposes the signal into a linear expansion of time-frequency components; however, this algorithm needs to select a discrete subset of possible dictionary functions for practical implementation . Liu et al. proposed a joint hop-timing and frequency estimation method that was based on the principle of dynamic programming (DP) coupled with 2D harmonic retrieval (HR) using antenna arrays. The complexity of the DP algorithm is roughly a fourth-order polynomial in the number of temporal signal snapshots. A stochastic modeling and particle filtering-based algorithm has been proposed by using a state-space model to solve nonlinear and non-Gaussian signals . Ko et al. proposed a blind maximum likelihood- (ML-) based iterative algorithm for frequency estimation and synchronization using a two-hop model; however, it yielded more than one solution, raising the problem of convergence to the solution that is associated with the hopping frequency. The authors  also pointed out that whether the approach of Ko et al. can guarantee identifiability for the frequency estimation. Additionally, in the ML-based estimation approach, if the transition time in the processing data block between two hopping frequencies is close to the boundary value, then the data block is in an unbalance situation of sampled signals in the frequency components. In this scenario, the performance of one estimation of frequency is severely degraded. This investigation presents a blind frequency estimation and timing synchronization algorithm. The approach is resistant to the aforementioned problem of unbalance. It reduces the computational load by using a proposed iterative method compared to a maximum likelihood-based greedy search method. The rest of this paper is organized as follows. Section 2 introduces signal model and the problem formulation. In Section 3, the proposed algorithm for estimating frequencies and transition time is derived. Section 4 presents the computational complexity. Section 5 presents the computer-simulated results. Finally, Section 6 draws conclusions. where and are the hopping frequencies, is the sampling period, and is the hopping period . where represent the channel gains of the hop through the transmitting path and is an added white Gaussian noise (AWGN) with zero mean and variance . The problem of determining in (2) is thus equivalent to solving the timing synchronization problem. Equations (11) and (13) indicate that frequencies and can be estimated by maximizing and , respectively. The maximization of the two functions can be regarded as finding and that maximize the values of , projected into the received signals and . The blind estimation scheme is developed in this section. The processing of the proposed scheme is divided into the synchronization phase and the tracking phase for parameter estimation. The details are as follows. Based on the analysis in Section 2, solving (8) is clearly a multivariable estimation problem ( , and ). To estimate frequencies and accurately, must be estimated correctly. On the other hand, the accurate estimation of depends on sufficiently accurate estimates of frequencies and . The most fundamental approach for solving this problem is a maximum likelihood-based greedy search approach, in which estimates are made by scanning the frequency and the transition time simultaneously, and finding the values of the frequency and time that maximize (8). However, the greedy search approach has an extremely large computational complexity although it may yield the optimal solution in some sense. To deliver competitive performance but reduce the computational load, the proposed algorithm is developed as an iterative approach by modifying the concept of the alternative projection algorithm that was proposed by Ziskind and Wax . Essentially, the approach converts a multivariable problem into a single variable problem and thereby reduces the computational load. The algorithm differs from that of Ziskind and Wax  and must be adapted to the FHSS problem. The proposed approach does not depend the complex matrix inverse calculation but simply applies a basic vector computation (inner product), which further reduces the computational complexity. In iterating the proposed scheme, the maximization is only conducted on one variable while the other variables are held constant. For instance, may be fixed first and the and that maximize the objective function are computed; after and have been estimated, and are fixed and then is estimated. After many iterations, the estimates of , and can be obtained. Since the transition time is unknown in advance, an initial value of , denoted as , is set, where the number in the superscript bracket stands for the iteration number and the overscript with the sign of a hat stands for "estimated value." For example, denotes the estimated value of in the initialization. Since is unknown in advance, the initial estimate can be selected based on the minimization of the initial estimation mean squared error in a statistical sense. is a random variable with a uniform distribution. The expectation of the random variable is . Therefore, the initial estimate minimizes the mean squared error. The initial value can be set to . Based on the above development, , , and can be estimated by fixing the values of the other parameters in each iteration. Notably, the value given by (20) obtained by utilizing the proposed processing procedure is monotonically increasing during the iteration. After a few iterations, it converges to a local maximum, and the local maximum may or may not be the global maximum. Situation with real K and estimated . According to (26), when , the expression contains the desired signal , noise, and an interference portion . Therefore, if is estimated using (26), then the estimation frequency error would depend on the difference and the noise. Additionally, since (26) contains both and , two peaks that correspond to and are identified in frequency scanning. Therefore, the initial value would affect the performance of the estimation. To solve this problem, can be adjusted close to . The task is achieved by performing the following operation. Consider the situation . Since the goal is to obtain for a balanced situation, is substituted into yielding the inequality . Hence, the situation of may occur if . The transition time of the received signal in a selected sample block is a random variable. When , the received signal block should be adjusted backward by samples. Following this adjustment, the transition time may fall in the range of ; a similar adjustment can be applied when . Substituting yields . The received signal block should be adjusted forward by samples, and the transition time may fall in the range . where , , , and are the first and the second largest power values in blocks and , respectively. The estimates can be made by performing the DFT operations. Once the timing of the received signal is determined, the frequency can be estimated by receiving every upcoming sample. However, Owing to timing jitter and possible hostile communication scenarios, it is necessary to track the timing and frequencies of upcoming data samples. The following processing step is proposed. Figure 2 presents the process in which the received signal is fed into the registers. The registries contain samples and two buffers, each associated with samples, which are used to adjust . Received signal samples in registers. Since is adjusted close to in the synchronization phase, in this phase, the received signal has a balanced block, and the iteration number can be set. The previous estimate of is used to estimate in the upcoming block. Therefore, the estimation of is eliminated. Notably, in (32), only samples are utilized to estimate the frequency to reduce the computational load and save time for the subsequent system operation. (In the hostile communication environment, e.g., a jammer/interfering operation may follow the estimation task.) However, if accuracy of the frequency estimation is paramount, then all samples may be adopted to perform the frequency estimation. It would rely on the type of the application, and using whole or sample for estimation is a trade-off between the computational complexity and the estimation accuracy. The steps in the proposed algorithm are summarized as follows. Step 1 (synchronization phase). (1) Receive signal samples and input the data to the registers and the buffers. (2) Perform the preprocessing procedure to estimate frequencies and . Step 2 (tracking phase). (1) Input the next samples to the registers. (2) Use the estimated parameter and (which is set to the estimated of the previous block) to compute the following. The Big-Oh notation is a well-accepted approach for analyzing the computational complexities of algorithms and is adopted. The computational complexity is analyzed in detail as follows. Let be the number of frequency scanning points, which is related to the frequency scanning resolution and is typically much larger than . In the ML greedy search scheme, every possible and the estimates of the two frequencies should be tried. For each possible transition time that is used to evaluate in (17), the computational complexity of the multiplication operations is , where is the number of points and the two subvectors of sizes and are involved in the operation. The computational complexity of the addition operations is by evaluating with all paired combinations of the arguments and . The selection of arguments in the maximum operation and the other operations has lower complexities and can be neglected when the Big-Oh notation is used. Accordingly, the total computational complexity of the multiplication operations is and that of the addition operations is . The proposed approach consists of the synchronization phase and the tracking phase. The multiplication and addition operations in the synchronization phase of the proposed approach are analyzed as follows. Referring to the algorithm summary, Step (A) has a computational complexity of and Step (B) has a computational complexity of . Step (B) of the preprocessing adjustment requires an extra complexity because of the two M-point FFT operations. The iterations stop after a fixed small number, which can be regarded as a constant . Therefore, the total computational complexity is . The computational complexity is lower than that of the ML-based method. Since the transition time of a received signal is random between 1 and , wrong estimates can be made in the unbalanced situation. Thus, the adjustment scheme is proposed herein to prevent such a situation. Similarly, the computational complexity of the scheme in the tracking phase is . Although it has the same order of the computational complexity as the synchronization phase; however, has been adjusted close to , and only one frequency estimation task is performed. The computational complexity is further reduced, since we can estimate one frequency instead of two frequencies and search for that is around instead of all possible 's. Real-time computing refers to hardware and software systems that are subject to a real-time constraint. The Big-Oh notation is well accepted for analyzing the computational complexity of algorithms. The true computing time of an algorithm varies with the processor, architecture, memory, and operating system used to execute it. Additionally, the computing power of processors continues to increase owing to progress in VLSI technology. When the computational complexity of an algorithm is polynomial time instead of exponential time, that algorithm is feasible for real-time application. Therefore, the concept of computational complexity is adopted herein to judge whether an algorithm is a real-time algorithm. A similar evaluation approach can be found in the literature. The use of parallel processing can also reduce computing time. For example, if processers are used, each may be assigned to evaluate the cost function of each frequency estimate, as in (18), which can be done separately and in parallel. As analyzed in this investigation, the computational complexity of the proposed scheme is , which is polynomial time rather than exponential time. An algorithm with a complexity of can be treated as feasible for real-time application. In this section, numerous simulations are conducted to demonstrate the efficiency of the proposed scheme. The hopping frequencies are set to [ ] Hz, and the channel gains are set to . The sampling frequency is and the hopping period is . The scanning frequency resolution is 50 Hz. To illustrate the convergence property of the proposed algorithm, Figure 3 presents the frequency error and the error in the estimation of the transition time versus the number of iterations for . The simulation results indicate that it converges after about two iterations. Number of iterations versus estimation error with K = 120. (a) Frequency estimation error. (b) K estimation error. To evaluate performance, the transition time is set to three conditions, , , and random , generated randomly between 1 and with a uniform distribution. The Cramer Rao lower bound (CRLB) for the balance block ( ) is also provided for comparison. (It is derived in the appendix.). 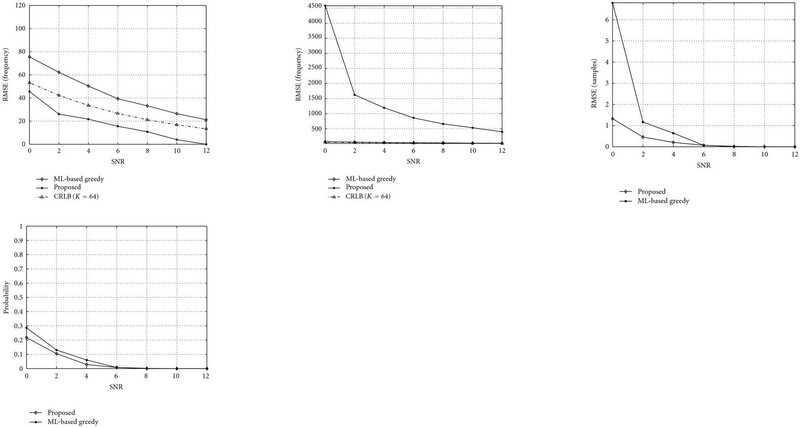 Figure 4 compares the performance of the proposed method with that of the ML-based greedy search method. It reveals that the proposed algorithm has comparable performance to that of the ML algorithm for a balanced block with . Figure 4(a) shows that the proposed method performs better than the ML algorithm in estimating the frequency, because the proposed algorithm adjusts the sampling position to , whereas the ML algorithm has a sample length of 56 for the estimation. The two algorithms perform similarly in this balanced block situation. However, the proposed algorithm outperforms the ML-based greedy search method in the following unbalanced block situation and in cases of random . Root mean square estimation error versus SNR with K = 56. (a) RMSE of estimate, (b) RMSE of estimate, (c) RMSE of K estimate, and (d) error probability of K.
Figure 5 presents the performance of the proposed scheme and the ML-based algorithm for a transition time close to the boundary of the data block, . As indicated in the result, because of the lack of samples, the ML-based algorithm yields large estimation errors, revealed in Figure 5(b), while the proposed algorithm performs stably as in the case of . In particular, in Figure 5(a), the estimation error of the ML-based method is lower than the CRLB because the data length exceeds that, , used in the CRLB. Root mean square estimation error versus SNR with K = 120. (a) RMSE of estimate, (b) RMSE of estimate, (c) RMSE of K estimate, and (d) error probability of K.
In practice, transition time is a random variable for a sampling data block. The transition time is set randomly between 1 and with a uniform distribution. 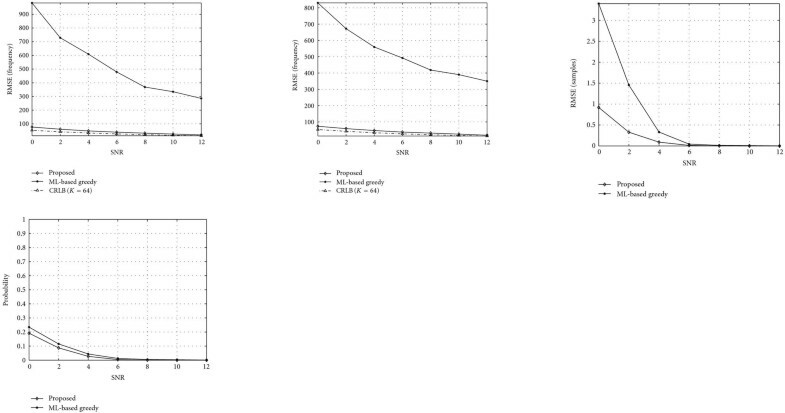 As indicated in Figure 6, the performance of the proposed algorithm is similar to that with . Root mean square estimation error versus SNR with . (a) RMSE of estimate, (b) RMSE of estimate, (c) RMSE of K estimate, and (d) error probability of K.
To demonstrate the tracking capability of the proposed processing scheme, the following simulation is performed with a sequence of ten frequencies. The hopping frequencies are [ ] Hz. The complex channel gains for these frequencies are , , , , , , , , , , , . The channel gains are generated using the expression , where and are normally distributed with zero mean and a variance of 0.05. The initial transition time is set randomly between 1 and . 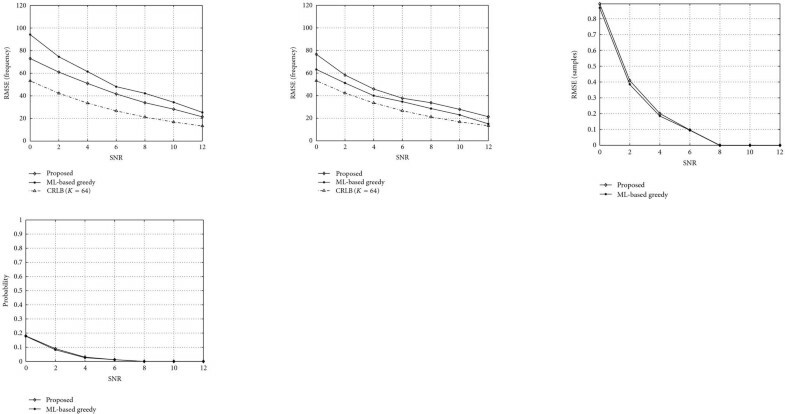 As shown in Figure 7, the frequency estimation errors are less than 100 Hz over the range of the evaluation. Root mean square estimation error versus tracking frequency with initial . (a) Frequency tracking and (b) RMSE of frequency tracking. Figures 8(a) and 8(b) compare the experimental complexities. The CPU is Intel(R) Core(TM)2 CPU 6320 at 1.86 GHz, and the computing time of the proposed algorithm is much lower than that of the ML-based greedy search scheme. Notably, the computing time can be reduced by optimizing the program codes and designing special computer architectures for implementing the proposed scheme. Comparison of CPU time. (a) Fixed M = 128 and N = 500 ~ 4000 and (b) fixed N = 1000 and M = 128 ~ 1024. A robust blind frequency and timing estimation algorithm is developed for frequency hopping systems. The proposed scheme has a lower computational load than the ML-based greedy search algorithm. The multivariable search problem is reduced to a single variable search problem. The algorithm does not require the simultaneous search of all times and frequencies, and its performance is comparable with that of the ML-based greedy search algorithm. The problem of unbalanced situations (where is close to the boundary) is solved using the proposed algorithm. The simulation results indicate that the performance is relatively independent of transition time , whereas the pure ML-based algorithm fails to estimate the parameters. The proposed algorithm can be adapted for tracking. The tracking performance is also demonstrated by utilizing the estimated parameters of and in the previous data block and the computational task of estimating is omitted to reduce complexity. The authors would like to thank the National Science Council of the Republic of China, Taiwan, for financially supporting this research under Contract no. NSC_99-2221-E-008 -039.